The oil palm sector in West Africa is developing extensively, yet plantation and small producers are performing well below their potential, with yields as low as one-third of the optimum. In order to improve oil palm yields and productivity in West Africa, IPNI has initiated a large-scale collaborative project with oil palm plantations and smallholder farmers supported by Solidaridad West Africa across Ghana. 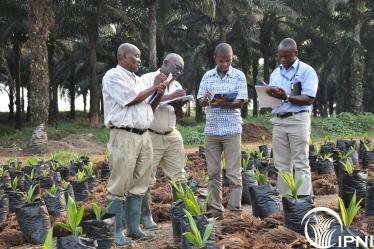 The project aims to facilitate the effective use of production inputs, such as crop residues and mineral fertilizers, and to assist plantation staff and smallholder farmers in the identification and implementation of improved agronomic techniques through the use of ‘Best Management Practices (BMP)’. The project is adapting lessons from a successful BMP program implemented by IPNI in SEA. Demonstration plots where BMPs are introduced were established in early 2013 at 3 participating plantations and 20 smallholder farms, and will be monitored over a 5-year period in order to assess its impact on oil palm production systems, and to get an understanding of the yield potential and yield gaps across Ghana.